Abstract: This article explores the potential of open-access videos available on the Internet as a data source to identify key areas in a rather broad topic in an international context. In order to understand the latest trends relating to a global issue, the study focuses on "global health," which is a growing interdisciplinary concept across health studies, international management and public policy research. By focusing on a video of a high-profile panel discussion in particular, the study also exemplifies main features of MAXQDA to assess the dialogues made by different speakers in the video. In doing so, the article considers key aspects related to the use of the existing videos and the nature of panel discussion, and how a combination of online videos and CAQDAS can pave the way for further research. 3.3 Discussion about a big issue: What is "global health"? In order to explore the latest situation relating to global health, the following section examines a video entitled "TICAD V Official Side Event: High-Level Panel 'From Okinawa to Tomorrow'". The panel discussion in this video clip was organized as a side event of the "Tokyo International Conference on African Development" (TICAD V), held in Japan in June 2013, and the video was subsequently published on YouTube by JCIEGlobalStudio as an official video from the event. This video was selected for this study from approximately 60 video clips that I collected for a broader research agenda for public-private interactions on global issues. It provides an ideal setting for the analysis of a wide-ranging discussion since the panel consists of experts in global health, but of different backgrounds. Therefore, the content of the discussion is very extensive reflecting each speaker's expertise. The panel discussion involves six speakers: a moderator and five panelists. They are affiliated with different global-health organizations. Table 1 outlines the profiles of the speakers. However, which way would suit most depends on the frequency of language switching and the length of talk in a different language. 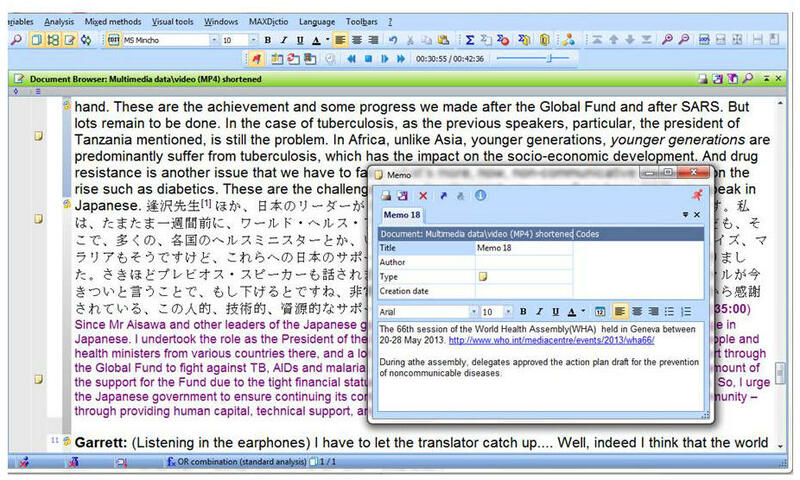 If language switching occurs only once or very few times in a video, the second option, i.e., transcribing in the original language (Japanese in the case of this video), and then providing a literal translation in English on the transcript can be useful to grasp what the speaker said at a glance, as shown in Figure 1. As many qualitative researchers are well aware, coding in a qualitative study tends to be a long process. Sharon BONG (2002) warns that there is a pitfall that researchers might regard coding as an end, rather than a means of theory building. As Raymond LEE and Nigel FIELDING (1996) argue, the prime aim of coding is data reduction. Therefore, simply indexing or coding line by line does not necessarily achieve conceptualization (SAILLARD, 2011). In analyzing a video of a panel discussion on a complex topic in particular, it is crucial to understand what each speaker is trying to say, and grasp a key point of the argument. In this study, MAXQDA's codeline browser was operated after careful coding in order to obtain a comprehensive view of the codes assigned to the transcription. 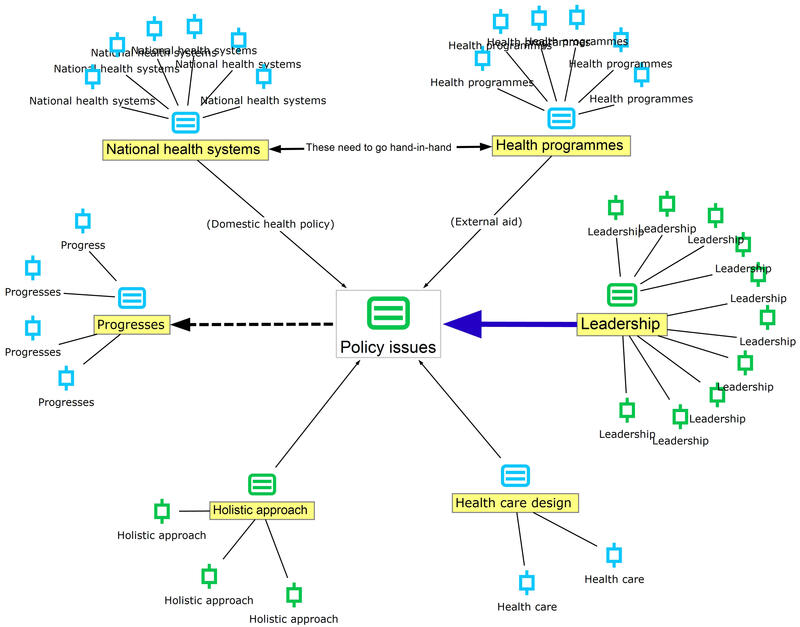 The codeline browser visualizes the structure of a document and overlaps of codes in different paragraphs. This feature is very useful throughout the analytical process of a panel discussion in terms of assessing the flow of conversation as well as each speaker's discussion points. 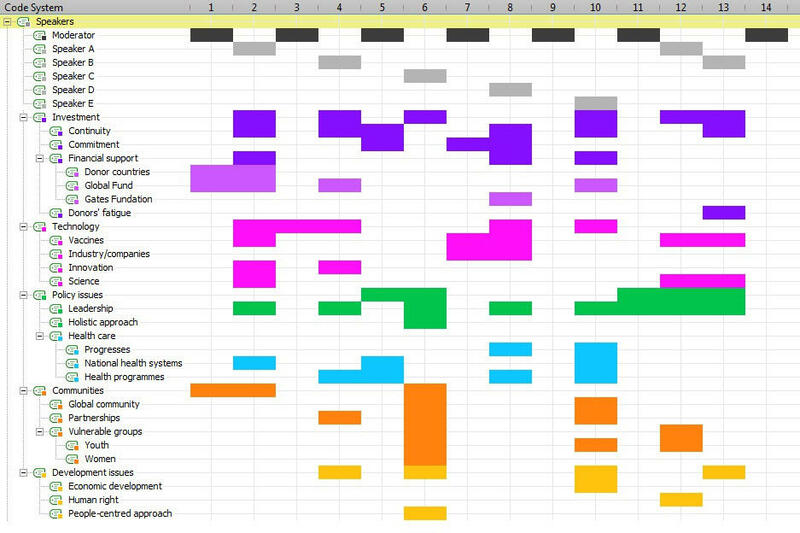 It illustrates how the discussion was organized, how the focus of the discussion shifted, and what codes were associated with each speaker, in a sequential manner. For the transcription of the panel discussion, this was done by coding each speaker's part with a relevant name, such as "Moderator," "Speaker A," "Speaker B," and so on, in the document. Figure 2 shows the code line for the selected codes assigned to the document. Now we will look into what the speakers talked about in relation to several issues in global health, and how often they referred to the topic/issue during the discussion; in other words, the associations between each speaker and different codes, as well as the frequency of the codes in the document. In doing so, the code relations browser is used. It is one of MAXQDA's visual tools, which indicates the frequency of the overlaps by the size of the square/circular nodes in a chart; it can also show the frequency numerically. The latter visualization is shown in Figure 3. 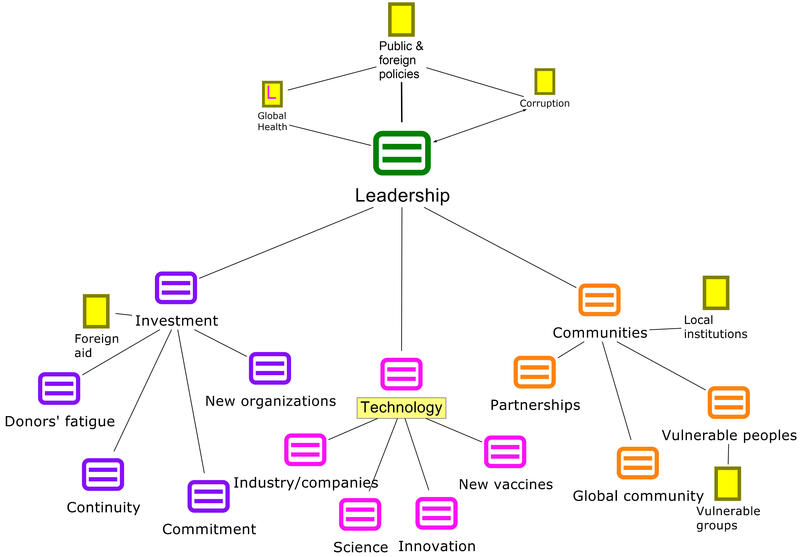 In Figure 3, the speakers are listed on the x-axis, while the four main codes, namely "investment," "technology," "policy issues" and "communities" and their sub-codes, are included on the y-axis. Sub-codes can be hidden/shown by clicking a plus/minus button at the top of the code. In Figure 3, only the sub-codes for "communities" are shown to demonstrate this. The value created by the code relations browser can be exported to an Excel file to obtain the total number of codes, as Table 2 shows. As the code relations show, overall the code group "policy issues" took up the biggest proportion of codes than the other main codes. Since the code category of "policy issues" is rather broad, it is now necessary to examine each sub-code in this category in more detail through the code-subcode-segment model. This model is one of the free-mapping tools, which are called MAXMaps in MAXQDA. The model investigates instances of sub-codes within a main code. In its standard format, the model displays the main code and its sub-codes in a radial symmetry connected by simple straight lines, but the diagram can be re-arranged by adding text, changing lines and moving objects. Less important sub-codes can be hidden in a different layer, or simply deleted. In Figure 4, six sub-codes in "policy issues" are activated. Each sub-code is connected to coded segments (shown as small, shield-shaped objects). The content of a segment can be viewed by hovering over a shield, so that it is easy to grasp what was actually said by a speaker in the exact place where the code is assigned. Grounded on the results obtained through MAXQDA, a conceptual map can be drawn using MAXQDA's code theory model. There are two ways to execute this: 1. drag codes onto the map one by one, or 2. drag a main code and its sub-codes onto the map together. In this project file, all of the main codes mentioned above are organized under the first-level code with the broad code name "key issues in global health." Thus, this parent code, together with all of the attached memos, was selected for insertion into the map window, and then they were reorganized on the map browser, as Figure 5 shows. Figure 5 still shows memos for reference purposes, but these can be hidden or deleted for clearer visual presentation. Albrecht, Gary L. (1985). Videotape safaris: Entering the field with a camera. Qualitative Sociology, 8(4), 325-344. Allegrante, John P.; Barry, Margaret M.; Airhihenbuwa, Collins O.; Auld, M. Elaine; Collins, Janet L.; Lamarre, Marie-Claude; Magnusson, Gudjon; McQueen, David V.; Mittelmark, Maurice B. & Galway Consensus Conference (2009). Domains of core competency, standards, and quality assurance for building global capacity in health promotion: The Galway consensus conference statement. Health Education & Behavior, 36(3), 476-482. Bong, Sharon A. (2002). Debunking myths in qualitative data analysis. Forum Qualitative Sozialforschung / Forum: Qualitative Social Research, 3(2), Art. 10, http://nbn-resolving.de/urn:nbn:de:0114-fqs0202107 [Date of access: November 14, 2013]. Borger, Robert & Cioffi, Frank (Eds.) (1970). Explanation in the behavioural sciences. London: Cambridge University Press. Brown, Theodore M.; Cueto, Marcos & Fee, Elizabeth (2006). The World Health Organization and the transition from "international" to "global" public health. American Journal of Public Health, 96(1), 62-72. Coovadia, Hoosen M. & Hadingham, Jacqui (2005). HIV/AIDS: Global trends, global funds and delivery bottlenecks. Globalization and Health, 1(13), http://www.globalizationandhealth.com/content/1/1/13 [Date of access: October 12, 2013]. Czarniawska, Barbara (2004). Narratives in social science research. London: Sage. Deppermann, Arnulf; Schmitt, Reinhold & Mondada, Lorenza (2010). Agenda and emergence: Contingent and planned activities in a meeting. Journal of Pragmatics, 42, 1700-1718. Dempster, Paul G. & Woods, David K. (2011). The economic crisis though the eyes of Transana. Forum Qualitative Sozialforschung / Forum: Qualitative Social Research, 12(1), Art. 16, http://nbn-resolving.de/urn:nbn:de:0114-fqs1101169 [Date of access: November 22, 2014]. Fele, Giolo (2012). The use of video to document tacit participation in an emergency operations centre. Qualitative Research, 12(3), 280-303. Franco-Paredes, Carlos; Zeuli, Julia; Hernández-Ramos, Isabel & Santos-Preciado, Jose I. (2010). Preserving idealism in global health promotion. Global Health Promotion, 17(4), 57-60. Garrett, Laurie (2007). The challenge of global health. Foreign Affairs, 86(1), 14-38. Gibbs, Graham R. (2004). CAQDAS (Computer-Assisted Qualitative Data Analysis Software). In Michael S. Lewis-Beck; Alan Bryman & Tim Futing Liao (Eds. ), The SAGE encyclopedia of social science research methods (pp.88-90). Thousand Oaks, CA: Sage. Goffman, Erving (1963). Behavior in public places: Notes on the social organization of gatherings. New York: Free Press. Gorli, Mara; Kaneklin, Cesare & Scaratti, Giuseppe (2012). A multi-method approach for looking inside healthcare practices. Qualitative Research in Organizations and Management, 7(3), 290-307. Griffiths, Frances (1996). Qualitative research: The research questions it can help answer, the methods it uses, the assumptions behind the research questions and what influences the direction of research. A summary of the panel discussion at the conference "Exploring qualitative research in general practice". Family Practice, 13(Suppl. 1), S27-S30. Harbour, Michelle & Kisfalvi, Veronika (2012). Looking desperately for courage or how to study a polysemic concept. Qualitative Research in Organizations and Management: An International Journal, 7(2), 166-188. Harzing, Anne-Wil with 32 country collaborators (2005). Does the use of English-language questionnaires in cross-national research obscure national differences? International Journal of Cross Cultural Management, 5(2), 213-224. Heath, Christian; Hindmarsh, John & Luff, Paul (2010). Video in qualitative research: Analysing social Interaction in everyday life. Los Angeles, CA: Sage. Hein, Wolfgang; Bartsch, Sonja & Kohlmorgen, Lars (Eds.) (2007). Global health governance and the fight against HIV/AIDS. Basingstoke: Palgrave Macmillan. Heritage, John (1984), Garfinkel and ethnomethodology. Cambridge: Polity. Hurmerinta-Peltomäki, Leila & Nummela, Niina (2006). Mixed methods in international business research: A value-added perspective. Management International Review, 46(4), 439-459. Jack, Leonard, Jr.; Grim, Melissa & Auld, M. Elaine (2012). Health promotion practice expands focus on global health promotion. Health Promotion Practice, 13(3), 289-292. JCIEGlobalStudio (2013). TICAD V official side event: High-level panel "From Okinawa to Tomorrow", http://www.youtube.com/watch?v=Ul7OCtqwFrk [Date of access: July 10, 2013]. Knoblauch, Hubert (2012). Introduction to the special issue of qualitative research: Video-analysis and videography. Qualitative Research, 12(3), 251-254. Knoblauch, Hubert & Schnettler, Bernt (2012). Videography: analysing video data as a "focused" ethnographic and hermeneutical exercise. Qualitative Research, 12(3), 334-356. Koplan, Jeffrey P.; Bond, T. Christopher; Merson, Michael H.; Reddy, K. Srinath; Rodriguez, Mario Henry; Sewankambo, Nelson K. & Wasserheit, Judith N., for the Consortium of Universities for Global Health Executive Board (2009). Towards a common definition of global health. The Lancet, 373, 1993-1995. Kuckartz, Anne M. & Sharp, Michael J. (2011). Responsibility: A key category for understanding the discourse on the financial crisis—analyzing the KWALON data set with MAXQDA 10. Forum Qualitative Sozialforschung / Forum: Qualitative Social Research, 12(1), Art. 22, http://nbn-resolving.de/urn:nbn:de:0114-fqs1101222 [Date of access: October 12, 2013]. LANCET (2009). Editorial, "Who runs global health?". The Lancet, 373, 2083. Laurier, Eric & Philo, Chris (2006). Natural problems of naturalistic video data. In Hubert Knoblauch, Bernt Schnettler, Jürgen Raab & Hans-Georg Soeffner (Eds. ), Video analysis: Methodology and methods—Qualitative audiovisual data analysis in sociology (pp.183-192). Frankfurt/M. : Peter Lang. Lee, Raymond M. & Fielding, Nigel (1996). Qualitative data analysis: Representations of a technology: A comment on Coffey, Holbrook and Atkinson. Sociological Research Online, 1(4), http://www.socresonline.org.uk/1/4/lf.html [Date of access: November 19, 2013]. Lewins Ann & Silver, Christina (2007). Using software in qualitative research: A step-by-step guide. Los Angeles, CA: Sage. Lurie, Sue G. (2012). Global health equity and advocacy: The roles of international non-governmental organizations. Health, Culture and Society, 2(1), 104-114. McGaughey, Sara L. (2004). Writing it up: The challenges of representation in qualitative research. In Rebecca Marschan-Piekkari & Catherine Welch (Eds. ), Handbook of qualitative research methods for international business (pp.529-550). Cheltenham: Edward Elgar. Mondada, Lorenza (2009). Emergent focused interactions in public places: A systematic analysis of the multimodal achievement of a common interactional space. Journal of Pragmatics, 41(10), 1977-1997. Mondada, Lorenza (2012). Video analysis and the temporality of inscriptions within social interaction: The case of architects at work. Qualitative Research, 12(3), 304-333. Ochs, Elinor (1979). Transcription as theory. In Elinor Ochs & Bambi B. Schieffelin (Eds. ), Developmental pragmatics (pp.43-72). New York: Academic Press. Ollila, Eeva (2005). Global health priorities—Priorities of the wealthy? Globalization and Health, 1(6), 1-5, http://www.globalizationandhealth.com/content/1/1/6 [Date of access: November 8, 2013]. Pink, Sarah (2001). More visualising, more methodologies: On video, reflexivity and qualitative research. Sociological Review, 49(4), 586-599. Ravishankar, Nirmala; Gubbins, Paul; Cooley, Rebecca J.; Leach-Kemon, Katherine; Michaud, Catherine M.; Jamison, Dean T. & Murray, Christopher J.L. (2009). Financing of global health: Tracking development assistance for health from 1990 to 2007. The Lancet, 373, 2113-2124. Richard, Fabienne; Hercot, David; Ouédraogo, Charlemagne; Delvaux, Thérèse; Samaké, Salif, van Olmen, Josefien; Conombo, Ghislaine; Hammonds, Rachel & Vandemoortelei, Jan (2011). Sub-Saharan Africa and the health MDGs: The need to move beyond the "quick impact" model. Reproductive Health Matters, 19(38), 42-55. Rosenstein, Barbara (2002). Video use in social science research and program evaluation. International Journal of Qualitative Methods, 1(3), 22-43, https://ejournals.library.ualberta.ca/index.php/IJQM/article/view/4598/3751 [Date of access: November 27, 2013]. Rovio-Johansson, Airi (2007). Post-acquisition integration: Ways of sensemaking in a management team meeting. Qualitative Research in Organizations and Management: An International Journal, 2(1), 4-22. Ruckert, Arne & Labonté, Ronald (2012). The financial crisis and global health: The International Monetary Fund's (IMF) policy response. Health Promotion International, 28(3), 357-366. Saillard, Elif K. (2011). Systematic versus interpretive analysis with two CAQDAS packages: NVivo and MAXQDA. Forum Qualitative Sozialforschung / Forum: Qualitative Social Research, 12(1), Art. 34, http://nbn-resolving.de/urn:nbn:de:0114-fqs1101345 [Date of access: October 12, 2013]. Schnettler, Bernt & Raab, Jürgen (2008). Interpretative visual analysis: Developments, state of the art and pending problems. Forum Qualitative Sozialforschung / Forum: Qualitative Social Research, 9(3), Art. 31, http://nbn-resolving.de/urn:nbn:de:0114-fqs0803314 [Date of access: October 12, 2013]. Schönfelder, Walter (2011). CAQDAS and qualitative syllogism logic: NVivo 8 and MAXQDA 10 compared. Forum Qualitative Sozialforschung / Forum: Qualitative Social Research, 12(1), Art. 21, http://nbn-resolving.de/urn:nbn:de:0114-fqs1101218 [Date of access: October 12, 2013]. Silver, Christina & Patashnick, Jennifer (2011). Finding fidelity: Advancing audiovisual analysis using software. Forum Qualitative Sozialforschung / Forum: Qualitative Social Research, 12(1), Art. 37, http://nbn-resolving.de/urn:nbn:de:0114-fqs1101372 [Date of access: October 12, 2013]. Skolnik, Richard L. (2008). Global health 101 (Essential public health). Burlington, MA: Jones & Bartlett Learning. Spiers, Judith A. (2004). Tech tips: Using video management/analysis technology in qualitative research. International Journal of Qualitative Methods, 3(1), 57-61, http://ejournals.library.ualberta.ca/index.php/IJQM/article/view/4486/3789 [Date of access: October 22, 2013]. Sridhar, Devi (2012). Who sets the global health research agenda? The challenge of multi-bi financing. PLoS Medicine, 9(9), http://www.plosmedicine.org/article/info%3Adoi%2F10.1371%2Fjournal.pmed.1001312 [Date of access: November 7, 2013]. Steyaert, Chris; Marti, Laurent & Michels, Christoph (2012). Multiplicity and reflexivity in organizational research: Towards a performative approach to the visual. Qualitative Research in Organizations and Management: An International Journal, 7(1), 34-53. Warren, Samantha (2009). Visual methods in organizational research. In David A. Buchanan & Alan Bryman (Eds. ), The Sage handbook of organizational research methods (pp.566-582). London: Sage. Weitzman, Eben A. (2000). Software and qualitative research. In Norman K. Denzin & Yvonna S. Lincoln (Eds. ), Handbook of qualitative research (pp.803-820). Thousand Oaks, CA: Sage. Welch, Catherine & Piekkari, Rebecca (2006). Crossing language boundaries: Qualitative interviewing in international business. Management International Review, 46(4), 417-437. Wilkinson, Sue (2004). Focus group research. In David Silverman (Ed. ), Qualitative research: Theory, method and practice (2nd ed., pp.177-199). London: Sage. World Health Organisation (WHO) (2010). The World health report, 2010: Health systems financing—the path to universal coverage. Geneva: WHO. Xian, Huiping (2008). Lost in translation? Language, culture and the roles of translator in cross-cultural management research. Qualitative Research in Organizations and Management: An International Journal, 3(3), 231-245. Yach, Derek & Bettcher, Douglas (1998). The globalization of public health, II: The convergence of self-interest and altruism. American Journal of Public Health, 88(5), 738-741. Dr. Faith HATANI is lecturer in international business at Manchester Business School, the University of Manchester, UK. Her research focuses on the role of international business in economic development. She is interested in qualitative analysis of public-private interactions in achieving development goals, and foreign direct investment in infrastructure, in particular in developing countries.